I have always encouraged others to make sure they take a moment to enjoy the small successes achieved along the way in working toward the larger goal. The road to reaching any accomplishment–whether it’s publishing your thesis or dissertation, finishing a long-range project at work, to training to be an elite rower–is long, difficult and inevitably filled with setbacks. So the importance of taking time to recognize the smaller successes is vital to keeping your confidence up and the momentum going. We all know what it feels like to be “stuck” or in a rut. It comes in the form of writer’s block or maybe you just can’t seem to shave off that extra second on your 2K to set a new PR (personal record) no matter how diligent you are about your training and how hard you work. There are far too many days we are all hard on ourselves and too few that we give our own back a congratulatory pat. Last week was a big week for my training record book. 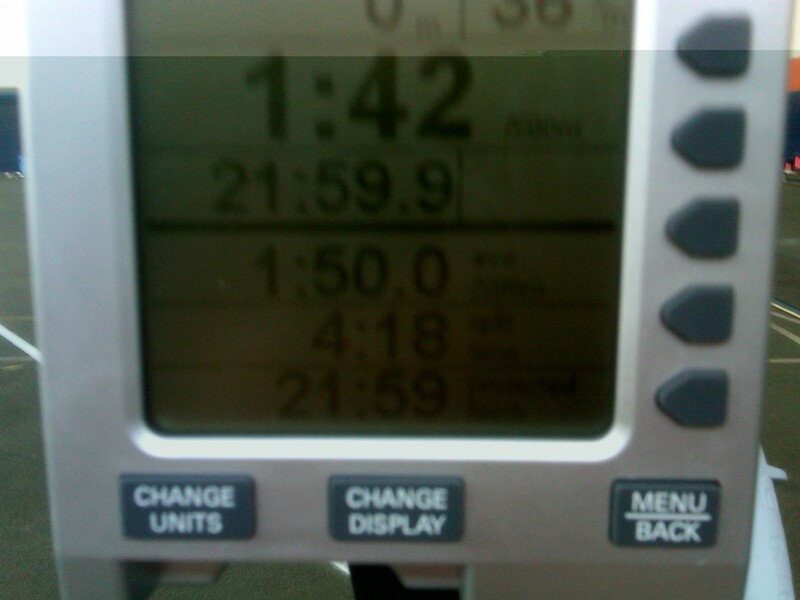 I pulled a new PR in both the 2K and 6K erg tests. Still on the steep side of the training curve, I am seeing significant results with almost every test so pulling new PRs isn’t anything new. The difference in these PRs was I succeeded in reaching two goals I had set for myself which felt pretty damn good. A little over two months ago, I set out a list of my goals I knew I needed to reach this year. Buying my own boat = check. I’m madly in love with my Hudson single. Breaking the 7 minute mark in the 2K (pulled a 6:56 for my new PR) and breaking the 22 minute mark in the 6k (pulled a 21:59 for my new PR) = check and check. You can kind of see the “21:59.9” in the picture above. In my state of gasping for oxygen and forcing myself to take light strokes to properly cool-down, I managed to snap a picture…like a proud parent when their child does something for the first time, I was a little excited…just barely broke 22 minutes but hell, I still broke it. That was true pain and what a lesson in how important every single stroke can be.